“A Characteristic Portrait of Prince Hohenlohe working Miracles,” by George Cruikshank. From Catholic Miracles; Illustrated with Seven Designs…To which is added, A Reply to Cobbett’s Defense of Catholicism, and his Libel on the Reformation (London: Knight and Lacey, 1825). Prince Hohenlohe is depicted here as a portly friar duping a blindfolded woman holding a bag of gold. Another friar is picking the woman’s pocket, while smoke rises to the ceiling of the cathedral decorated with discarded crutches of the healed. 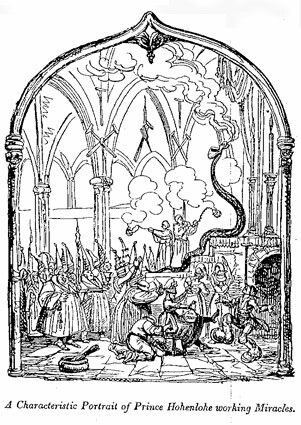 A crowd of laughing monks and religious women and an image of a charmed snake complete Cruikshank’s anti-Catholic imagery. "Nancy Schultz has produced another extraordinary work of historical recovery, bringing vividly to life a cast of characters that could easily populate a major motion picture even as they reveal hitherto neglected aspects of nineteenth-century social, religious, and intellectual history. The provocative questions raised by Mrs. Mattingly's Miracle will linger, satisfyingly, with readers long after they've reached its unusual conclusion." "Mrs. Mattingly's Miracle uses terrific archival work and shrewd analysis to firmly anchor a remarkable episode in American religious history in a transatlantic context." "An entertaining and meticulously-researched study of one of the first accounts of miraculous healing in the young United States. Schultz illuminates every possible angle of the Mattingly story, thereby enriching American and Catholic history immeasurably." "Nancy Schultz has written a fascinating narrative highlighting the historical, religious and social dimensions of miraculous cure of Ann Mattingly. This is a first-rate original work of sound scholarship." "Schultz's work to track down information about the key figures, previous events and subsequent experience is remarkable. She tells the full story, with 'thick description' of the 'Capital Miracle'."